Hi, when a post is deleted for bad or inappropriate framing, is there a span of time that the mods and/or our community feels another member should wait before building a better post? Starting a steam engine link? My searching has failed me. Can anyone point me to a comment that had a link to an essay about one man starting a steam locomotive by himself? If you need a bit of levity today, please go read geek anachronism's story about how she washed a five-foot tall My Little Pony plushie. That is all. YOUR EAGLE IS CALLED MEFI - A story of how I gave away a twitter handle to a football club in France because their badass eagle is now called Mèfi. This article from June 12 has a lot of useful up-to-date info and context about how MetaFilter was penalized. There is also some discussion about a potential solution (although Matt Cutts is being typically cryptic) in coming "weeks or months." Fanfare pony request: automatic tagging? This is the metatalk thread for the MeFi Diplomacy game "Metafilter1"(on playdiplomacy.com) spawned by the recent Grantland boardgames thread. To enable maximum kibitzing, I would like to encourage all PUBLIC game related communications to take place in this thread. PRIVATE communications, of course, can still take place through in-game channels. Robocop is bleeding has offered himself up as unofficial reporter/biographer/historian for the game, so we'll see where he takes that. I will try to post periodic links to up-to-date maps in this thread, but you can also watch the game by signing up at playdiplomacy. I'd like to offer delighted congratulations and the warmest of Mefi wishes to long-time members Miko and Lipstick Thespian, who were married on Sunday, June 8th at a lovely farm in New Hampshire. Mazel tov and wishing you many years of happiness! MeFi helped me through the darkness. Five years ago today I lost my wife suddenly and unexpectedly. MeFites came out of the woodwork with words of support, hugs, shipments of books, postcards, notes, and even pie! I got advice from others who had been through similar tragedies; new friends and penpals; all together, it was an awesome show of love and caring. I made it through the darkness, and since then have also been able to help others who have had the same thing happen to them. I just want to say thanks, again, to everyone. If this seems disjointed, it's because I can't find the right words to express how I feel. I can't believe it's been five years. Chrome suddenly has disallowed extensions if they don't come from the chrome web store, and you cannot re-enable them, and this includes all my metafilter ones (deleted posts, scroll tag). None of them appear to be in the chrome store. This appears to be a deliberate decision by Google -- is someone (I don't know who wrote them immediately, but I definitely lack the knowledge to do so) going to put them in the Chrome store? Or is there a workaround? Do I go back to Firefox? Leveraging the community to help develop Mefi functionality? Looking for a series of comments on the right to live free from pain. Breaking news - Not any more? I am too lazy to select a bookmark every time I want to use yourcelf's excellent GraphFi bookmarklet, but apparently not too lazy to write a wee Safari extension to add a little ➡️ button to each post page that runs it. Companies mentioned in AskMe post to AskMe? What's the rule for comments like this, wherein a company mentioned in an AskMe purportedly registers an account and responds? 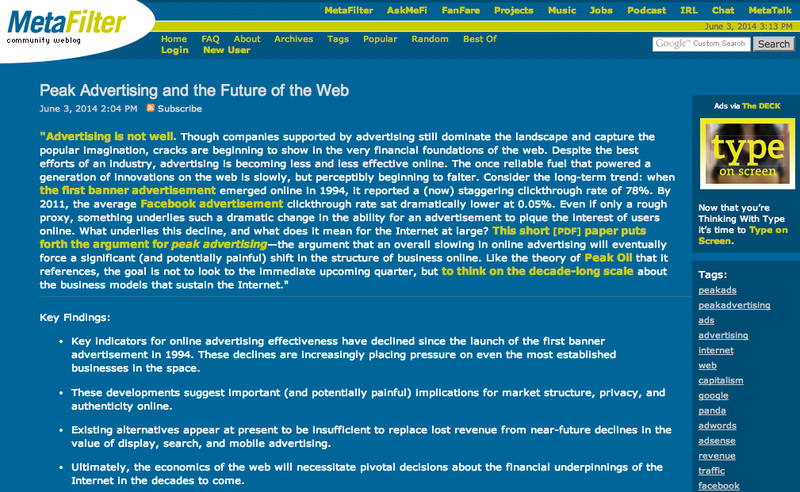 "How Google is Killing the Best Site on the Internet"
Because You're Worth It, Metafilter. How about a "Donate/Subscribe" link in the main menu of the site? As it stands now, if a user happens to hide the "Help Fund Metafilter" link at the top of the page, it disappears, never to be seen again. I don't think it's unseemly to make the option to support the site monetarily a little more visible and persistent.